My youngest son, Giuliano, dipped his croissant in his milk, took a bite and looked up at me. I remember that day so well. It was the one that brought the phone call that changed everything. The call from Atletico Madrid, saying they wanted to speak to me. The one about me becoming manager of the club. There are two sides to that, of course. On the one hand it’s lucky, because I want to do well. But on the other hand it’s unlucky, because I don’t get to see my kids growing up. I was 27 or 28 years old when I really decided I would become a manager. I would go home from training – I played for Lazio then (above) – grab a folder and pretend I was taking a training session. You know the way kids imagine things, when they are playing? I would do the same as an adult, playing at being a manager. I used my team and pictured myself taking parts of training. I imagined the next match and planned out everything I needed. By the end of the day I’d be surrounded by sheets of paper, each one covered with drawings or notes. I liked to write everything down. Doing all of these things started to generate a lot of enthusiasm in me. As a coach, the greatest passion you can have is for improving players. 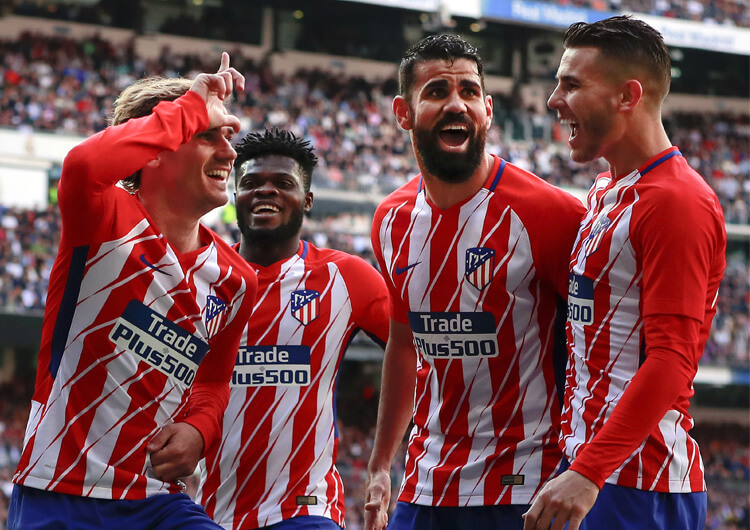 Of course, becoming champions is something we all want, but I think that the best ‘championship’ for a manager is to see players like Koke, Lucas Hernandez, Angel Correa – lads who have come up from all the way down in the lower divisions – become professionals of a high standard. When the time came to stop playing and start being a manager, I was back home in Argentina, where I finished my playing career at Racing Club. The first time they offered me the manager’s job, I understood that I should say no. The second time? The same. At the third time of asking, I said yes. The team was in very bad shape, I knew that. But I also knew the players, because I’d had them as teammates and I believed that we could do a good job. That belief was tested immediately. Sitting on the bench for the first time is the most difficult thing a manager can go through. For me, it took a while to get any easier. We lost our first three games. We didn’t even score a goal. People at Racing were very nervous. There were a lot of problems – a lot of experiences that we had to overcome – but going through that gave us strength. It gave us more reassurance in what we believed. If there is one thing I am, it is very hard-headed. If I want something, I go after it – and I go after it ad nauseum. This brings me back to Atletico Madrid. When I left the club in 2005, it was as a player who was not participating much within the team. And one who knew very well that my presence there wasn’t working, because it didn’t give the manager peace of mind. Why? Because of the name you have as you get older, and the effect that has on journalists, the fans and the whole situation surrounding that. But from the moment I left Madrid, I started preparing my return. I knew I was going to end my playing career in Argentina, and that I would start to manage there. 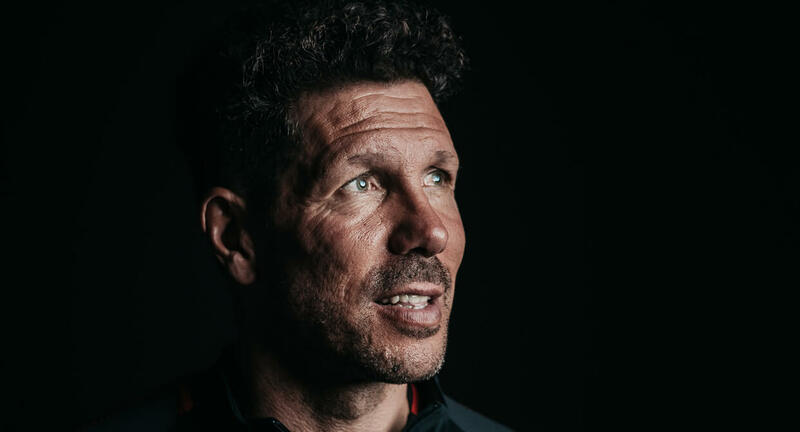 But, somehow, I also knew the opportunity would come up to manage Atletico Madrid at a difficult time, so I got ready for that. When it happened, I didn’t think too much about what I would say in my first meeting with the players. I have never been someone who prepares in great detail what I’m going to say – I try to be spontaneous. To speak as I feel. I knew I had an advantage. For five and a half years, I’d been a player here. 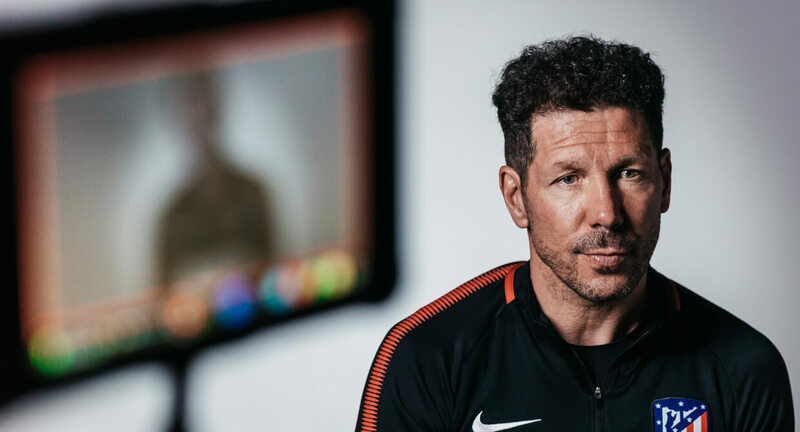 I knew the kitmen, the employees, the president, the Vicente Calderón seats, the people sitting in them… all that knowledge gave me the chance to head directly towards what they wanted. 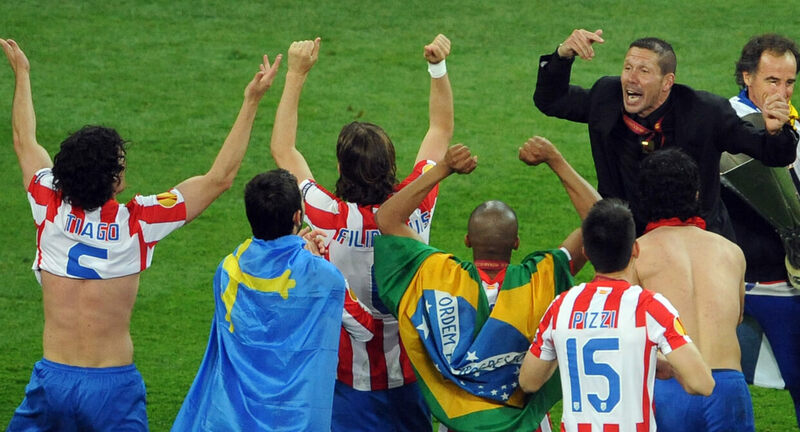 The people of Atletico always wanted a competitive team. A team that was strong in defence. A team that would play on the counter-attack and be a nuisance for the super-powerful sides. My objective was focused on that. When I arrived, the players were not going through a positive time – they were 10th in La Liga and had been knocked out of the Copa del Rey by Albacete. But I believed they could give people what they needed. There was a very strong connection between the people and the players. And so, as always happens in this sport, the people get swallowed up by this passion. That’s football. The real starting point came five months after I arrived. Winning our first Europa League title together was the beginning of a new, important cycle. A cycle that meant we were committed. One that allowed us to see the facts clearly. Without a doubt, that Europa League was the beginning for this group – a group that, right from the start, knew what it wanted. To fight against the greatest. To win the league in Spain competing with Real Madrid and Barcelona is almost impossible. Throughout that decade, those two teams had been a tremendous force, with unbelievable players. But with hard work, continuity and perseverance as well as great players – because, without great players, you couldn’t achieve what we have – we made the almost impossible, possible. How? Day by day, we kept believing in what we were doing. And in my second full season as manager, we got our chance. We saw that one of those two teams – Real Madrid – had gone off course a little. So we went for the one that was left: Barcelona. On the final day of the season, we went to the Camp Nou needing at least one point to win the title. Needing to impose ourselves on their pitch. Needing to do something that is almost impossible. After the final whistle, together with Germán Burgos, my assistant, I started to laugh. We knew that we could win the title, but when it was confirmed the first thing I felt was joy. And after that? It’s difficult to really explain it. It’s a whole mixture of feelings. That season is one that will surely be remembered in Spanish football history. But in football, it’s impossible to really stop and think and enjoy it, because while you’re sleeping, someone else is working. Sometimes we wonder if it’s possible, taking account of the different time zones, to work 24 hours a day: one working here, and another there, so nobody is sleeping. Because football is a tough marketplace. We don’t have the options of the super-powerful, to spend €150m or €200m on a player. So, we have to try and be creative, keeping in mind what we need to make the team better and which pieces of the team we are developing. Year on year, we add to it. That means we have to work a lot and have no failures when it comes to the signing of players who are going to make the team better. If that sounds tiring, I have to say it is. When one prays and is close to one’s thoughts, the only thing I ask for is energy. I ask for the energy to remain calm and to communicate what I feel. That’s the hardest thing to sustain, because from one day to the next it can just switch off. You can see some influences from my career as a footballer in the way that I am as a manager. 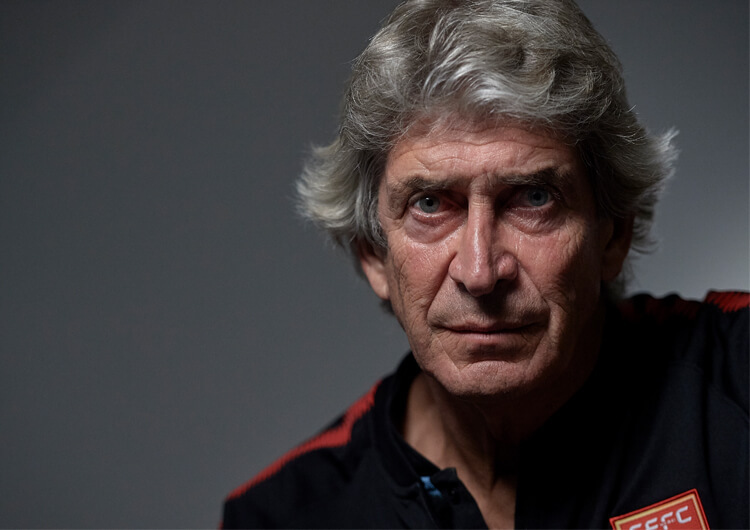 No doubt there are shades of Italy and Spain brought together in a manager who a lot of people say is defensive. But really, playing and managing are two different lives. When you are a footballer, aside from knowing about the needs of the team, you think of yourself. As a manager, it’s the opposite. You have to see everything. You have to try to make everything good, minimise your rivals’ strengths and enhance your own. Above all, you have to be strong because, throughout the season, there are a lot of times when you must come out with the right words at the right time so the players can follow you. To find those right words, you must have an open mind. I listen a lot. I ask a lot. And then, well, I end up doing what I think is best for everyone. 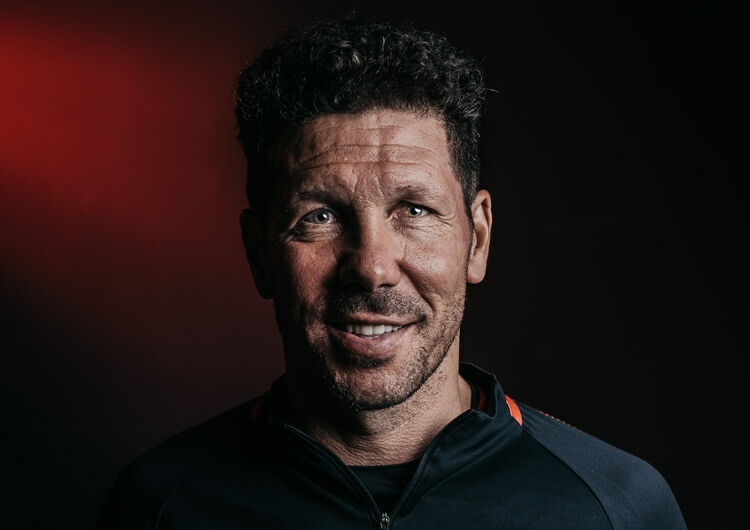 Seven years later, I have to say that Atletico is my life – I have 13 years of history linked to one club. Thirteen years of history doing the almost impossible.